"Heritage" wasn't always the buzzword it is today. In an industry rampant with overseas outsourcing, Billykirk chose to craft its leather goods in the United States before it became fashionable to do so. Founded by Tennessee-born, Minnesota-raised brothers Kirk and Chris Bray in 1999, the label makes its current home in New Jersey, just across the Hudson River from lower Manhattan. Much of the work is done by Amish craftspeople in Pennsylvania who work by wood-burning stoves when daylight grows scarce in the cold-weather months. 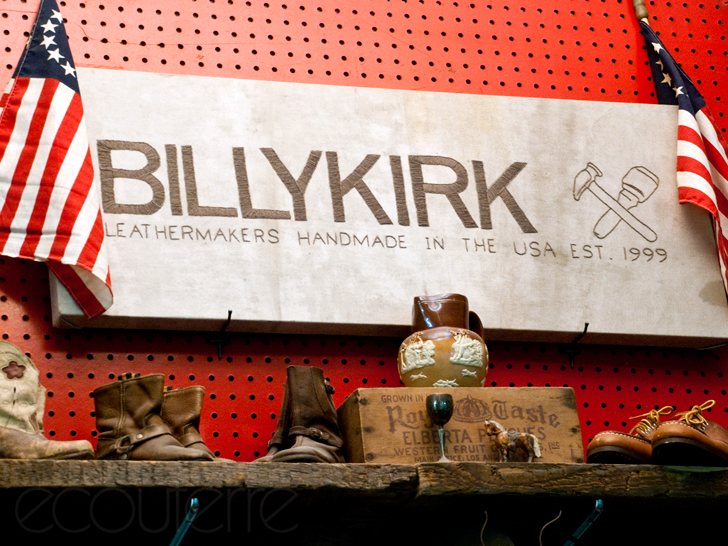 It's a lifestyle that dovetails perfectly with Billykirk's rugged, back-to-basics aesthetic, which prefers aged and worn to shiny and new. It was in Los Angeles, however, that Billykirk found its footing, beginning as a small outfit that tinkered in handmade leather watch straps. Kirk, the younger Bray, has a fashion degree from the University of Wisconsin, while Chris, who was working in real estate at the time, majored in business. Billykirk started in Los Angeles in 1999 as a small outfit dealing with handmade leather watch straps. After apprenticing themselves to Arnold Arons, a third-generation leather worker with a shop in downtown L.A., the brothers began experimenting with other items like wallets and belts. In 2005, they packed up their families for a move to New York City. After finding Brooklyn too expensive, the Brays wound up in Jersey City, where they remain to this day. “We work with an heirloom mentality where you pass [things] down,” Chris tells Ecouterre. 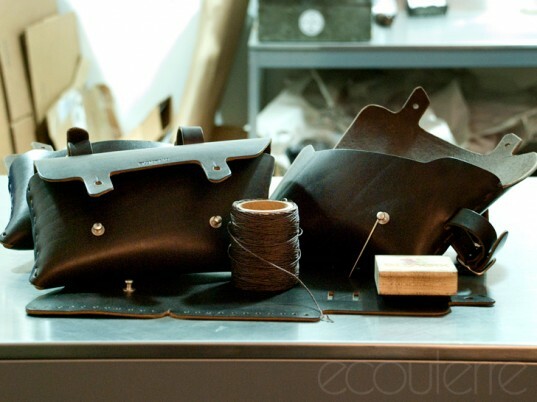 The Brays, who draw up the preliminary designs in their studio, source their leather from the few remaining tanneries in the United States, including Pennsylvania-based Wickett & Craig, which specializes in vegetable tanning. Even their die patterns, constructed from wood or steel, are produced domestically. It’s a supply chain that works within parameters that are as close to local as possible, a tack that not only sustains jobs in America but also minimizes the brand’s carbon footprint. Over the years, the Brays have forged relationships with several kindred businesses, including Chicago’s Horween Leather Company and Pennsylvania’s Bollman Hat Company, the oldest milliner in the United States. 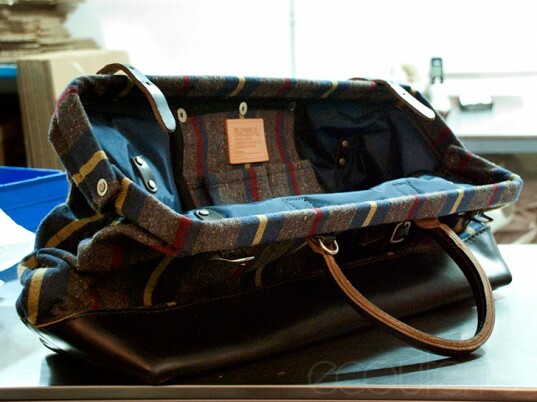 With resurgent interest in American craftsmanship, Billykirk has found its niche, attracting retailers large and small. With resurgent interest in American craftsmanship, Billykirk has found its niche, attracting retailers large and small, such as Bloomingdale’s, J.Crew, and In God We Trust. Other countries have also taken note, with Japan by far the largest international consumer of its products. The timing of the heritage trend and one of the worst financial crises in American history is no coincidence. It was in Los Angeles, however, that Billykirk found its footing, beginning as a small outfit that dabbled in handmade leather watch straps. Kirk, the younger Bray, has a fashion degree from the University of Wisconsin, while Chris, who was working in real estate at the time, majored in business. The studio permeates with a rough-and-ready yet sophisticated air. 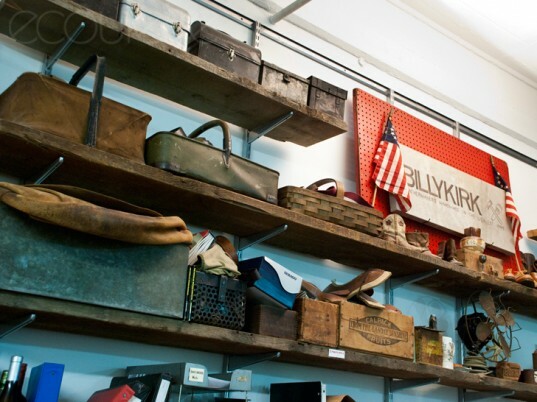 Emblems of Americana abound: vintage wooden crates, cowboy boots, metal lunch boxes, and other memorabilia line the shelves as a source of inspiration. 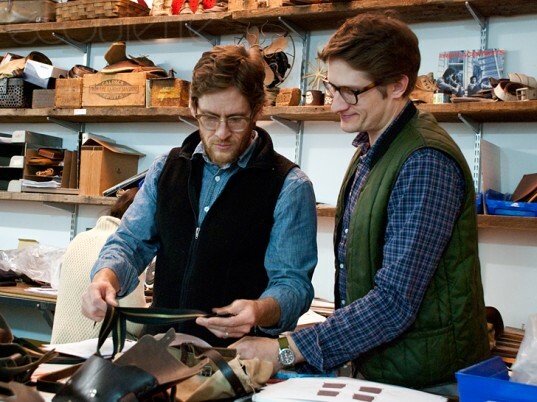 The Brays, who draw up the preliminary designs in their studio, source their leather from the few remaining tanneries in the United States, including Pennsylvania-based Wickett & Craig, which specializes in vegetable tanning. Even their die patterns, constructed from wood or steel, are produced domestically. It's a supply chain that works within parameters that are as close to local as possible, a tack that not only sustains jobs in America but also minimizes the brand's carbon footprint. Over the years, the Brays have forged relationships with several kindred businesses, including Chicago's Horween Leather Company and Pennsylvania's Bollman Hat Company, the oldest milliner in the United States. Although manufacturing costs remain high Stateside, a revived domestic industry could only bolster the sagging economy, according to the Brays. The timing of the heritage trend and one of the worst financial crises in American history is no coincidence. "The financial meltdown is a perfect example of greed gone bad and it how it festers itself into all areas of commerce," Chris says. "It's exactly why we are seeing this homegrown U.S.-made pride taking shape." It's easy to see, then, why Billykirk has such a sizable cult following. Unlike the products you find in big-box stores, each piece is manufactured with care by actual people. It's easy to see, then, why Billykirk has such a sizable cult following. Unlike the products you find in big-box stores, each piece is manufactured with care by actual people. For a generation that has lost touch with the art of making, Billykirk signals a return to a simpler, less-harried time. “It’s the whole craft," Chris says. "People are using their hands again."